Zack Hunt over at The American Jesus is doing a series of posts called “Blogmatics” in which he fleshes out the theological assumptions that inform his blog posts. A couple of days ago he discussed discipleship and the life that believers are called to in a post entitled Blogmatics: The Cost of Discipleship. 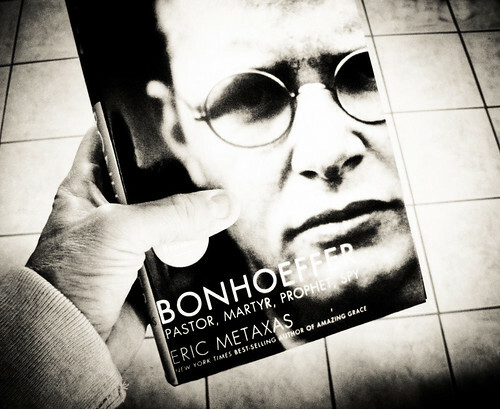 He draws heavily on the thoughts of Dietrich Bonhoeffer in this post. God’s grace is given freely; it’s true. But the cost of accepting this gift of God is dear. We are called to imitate the life that Jesus lived, including his obedience and sacrifice. Zack nailed it in his blog post. We hope you’ll allow this post to challenge and encourage you. I want a cross centered faith, a faith that makes demands of me each and every day to die to self in increasingly more radical ways. I want a faith that is fundamentally not about me, a faith that drags me kicking and screaming out of my comfort zone and to the feet of a stranger in need. I want a faith that tells me how to live, a faith that takes who I am and transforms me into who I need to be. I want a faith that looks like Christ is still living and incarnate and walking the earth again through me.